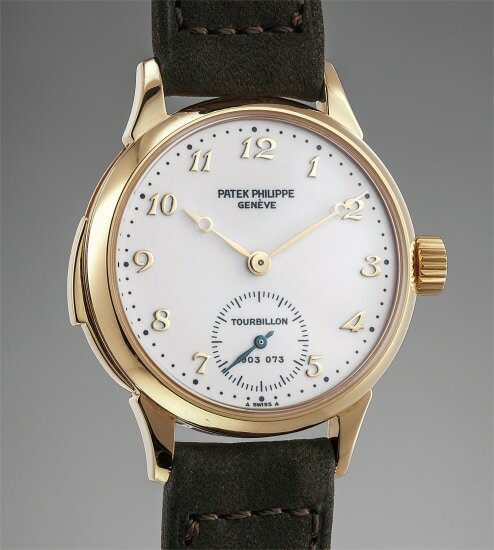 First launched in 1993, reference 3939 is one of Patek Philippe's most iconic and important models ever produced. Elegant and subtle, it captures the spirit of the Genevan watchmaker through its technical mastery, combining a minute repeating mechanism with a tourbillon complication - all housed within the confines of a 33 millimeter case. It furthermore boasts a beautiful enamel dial with Breguet numerals. Assembling a minute repeater typically requires 200 to 300 hours of work, and the gongs display a rich, deep yet delicate resonance that Patek Philippe is best known for. Most notably, the present watch is a later series example, as it is fitted with a larger crown intended to prevent overwinding the mechanism. Preserved in excellent condition, the watch furthermore repeats in phase with a beautiful tone and clarity. It is complete with an additional caseback, Contrôle Officiel Suisse des Chronomètres Watch Rate Certificate and Original certificate, stating the watch was sold at Beyer Chronometrie on 2 January, 2005.